Two 17-year-old boys found dead at the bottom of a cliff have been named by police. 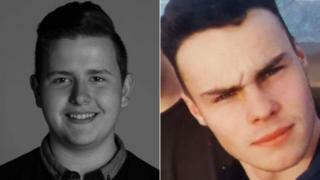 The bodies of Harry Watson and Alex Yeoman were found by officers at Huntcliff in Saltburn, at about 19:00 GMT on Friday. Police are continuing to investigate the circumstances but said they were not treating the deaths as suspicious. Tributes have been left at the scene to the boys, both from the East Cleveland area. Harry's family described him as "precious" while Alex's family paid tribute to a "loving son" who will be "sadly missed". Harry's mother, Tanya, also posted on Facebook: "It is with great sadness and sorrow that last night our precious 17-year-old son Harry Watson has passed away." She said: "Please understand at this difficult time we don't have many answers but Harry is one of the gifts in life always there for everyone and anyone. "He will always live in our hearts and we will get through this as the strong family that we are because that's what Harry would have wanted." Both families are being supported by specialist officers, the force added. Police continue to appeal for witnesses who may have been in the area of the Circle Sculpture at Huntcliff on Friday to contact Det Sgt Paul Hodgson on 101.